First of all, you’re on the right track! Meeting with a rabbi is the first step on a path to conversion. You may have been reading and studying, you may even have been going to services, but until you meet with a rabbi, it’s all academic. As for “preparing” – Just go and be yourself. If you can speak the words, “I’m interested in conversion to Judaism,” that’s good enough. The rabbi can help you from there. There is a very old tradition in which rabbis send a person who inquires about conversion away three times before actually having the conversation. While I don’t know of any Reform rabbis who currently follow that tradition, you may encounter a rabbi who does. On the other hand, if the rabbi says, “I don’t do conversions” then ask for a referral – or just go find another rabbi yourself. If you get what seems like a lukewarm welcome, understand that this, too, is part of the tradition. Jews don’t proselytize, and we have been on the receiving end of many efforts to convert us. Therefore we tend to hang back and not get too excited when someone says, “Hi! I want to be a Jew!” You aren’t unwanted. We just want to make sure it’s what you really want. Persist. No rabbi is going to rush to sign you up for conversion. It’s a very serious step. This first meeting is just that – a first meeting. Even if you choose to work with this rabbi, you have at least a year of studying and living Jewishly before an actual conversion. You do not have to convert with the first rabbi you meet. If you are comfortable with that rabbi, great. If you aren’t comfortable, then maybe this rabbi isn’t the right rabbi. Try another one. We’re all different. Questions are OK. Questions are encouraged. I wish you the very best with your first meeting, and with your journey, wherever it takes you! Not every Jew is a reliable source of general information about Judaism. Not all of us have had extensive Torah education, for starters. Some Jews will say, “I don’t know, ask a rabbi” and others will tell you what their bubbe [grandma] told them on the subject. For them, that might be more authoritative than any rabbi. The question of organ donation is complex. If we are talking about a donation from a brain dead body, and it will almost certainly save the life of the recipient, then Reform, Conservative, and many Orthodox sources agree, this is not only a permitted donation, it is a mitzvah. The principle involved is pikuakh nefesh – saving a life. However, that’s the big picture. What about the donation of corneas, which give vision to the blind but do not technically save a life? What about donations that will extend medical knowledge, but not immediately save a life? In such cases, I’m going to say this: talk to your rabbi. Not some random rabbi, not some rabbi on the Internet, but YOUR rabbi. Don’t have a rabbi? If you are serious enough about being Jewish to have such questions, then you are serious enough to need your own rabbi. Get one. Know that the Internet is full of “authorities” who make all sorts of pronouncements. You can likely find someone who says anything you want to hear, whether that’s “anything is OK, don’t worry” to “no organ donations from a dead body ever, under any circumstances.” The Internet is the Wild West: anyone can call themselves “rabbi” but that doesn’t make them one, nor does it necessarily make them the right rabbi for you. Questions like the ones above require conversations. You may say, “It’s a simple yes or no!” but no, it isn’t. A lot depends on how you understand Jewish law or tradition (and as much as some folks would like you to think there’s one proper way, no there is not – not even among Orthodox communities and rabbis) and a lot depends on the fine details of a situation. So you need to talk to a rabbi. Bottom line: Judaism does not have a blanket condemnation of organ donations. In some situations, organ donation is a big mitzvah. For more than that, talk to your rabbi. A Gift for the Rabbi? Homemade preserves or baked goods. A bottle of good kosher wine. The key to this, as with all gift-giving, is to think about what the person might enjoy. If you know of a particular interest or hobby that your rabbi enjoys, then that will make this an easy choice. Things that they can enjoy with their spouse or family are thoughtful gifts, as time with family is often particularly precious. Something that will provide a small comfort: a free cup of coffee, for example, can be very nice. You might be surprised that Judaica is not on this list. Many rabbis have all the candlesticks, kippot, tallitot, seder plates, and so on that they can use. The same is true of Jewish-themed ties, earrings, and so on. The exceptions to this are things made by children: if your child colors something for the rabbi, it will be treasured. Posted on August 12, 2015 August 12, 2015 Categories Ask the Rabbi, Synagogue LifeTags gifts, Rabbi2 Comments on A Gift for the Rabbi? Why Can’t Jews Get Married on Shabbat? “Why can’t Jews get married on Shabbat?” a reader asked me recently. She and her fiancé had made a lot of expensive wedding arrangements, only to discover that very few rabbis will officiate on Shabbat (between sundown Friday and sundown Saturday.) Now they are scrambling to find an officiant that will agree to officiate before sundown on a Saturday evening in the summertime. TRADITION – At weddings, couples do many expensive and inconvenient things to honor tradition. Brides may pay hundreds, sometimes thousands of dollars for a dress they will only wear once. Couples mull over the “old, new, borrowed, and blue” custom. People who do not frequent synagogues or churches suddenly need a rabbi or priest. We do these and other things because on one of the biggest days of our lives, tradition matters. And it is Jewish tradition that weddings do not take place on the Sabbath and certain other days. SHABBAT – Shabbat began at creation: as the story goes in Genesis 1, in six days God worked to make the world, and on the seventh, God rested. One of the traditions of Shabbat is that like God in the creation story, we don’t create new things on that day. What happens at a Jewish wedding is the creation of a new household among the Jewish People. It’s one of the most important events in not only the couple’s lives, but in the life of their Jewish community and the Jewish world. It should have a good start, and for a Sabbath-observant Jew, “breaking” Shabbat is not a good start. RABBIS – Rabbis become rabbis because they care deeply about Judaism. Shabbat is the holiest day of the Jewish week, and it actually “outranks” nearly all the holidays. It isn’t a judgment on the couple or the family; it is a question of the rabbi’s personal boundaries. So what is a couple to do? 1. Talk as a couple about what you really want out of this wedding. Is Jewish tradition important to you? If so, get in touch with a rabbi and include them in the process. They will be happy to take you through a process of learning the Jewish traditions for weddings and making educated choices about what you do and don’t want. 2. If you are in the early stages of planning your wedding, talk with your rabbi before you put deposits on the venue and the caterer! 3. If you have already made arrangements that cannot be changed, then it’s more complicated. There are some rabbis who officiate on Shabbat, but you may have to look out of town to find one. If it is actually not all that important to have a rabbi, maybe you have a relative or friend who could officiate. Many states have arrangements for one-day officiants. Any marriage that is recognized by the state is also recognized by the Jewish people. Please don’t be mad at the rabbis you call who say they won’t officiate on Shabbat. They are exercising their right to observe Judaism according to their beliefs. You are exercising yours as well. You and that rabbi just aren’t a good match. Getting angry or calling them names will not persuade them to do what you want. Posted on April 13, 2015 April 13, 2015 Categories Jewish ConsumerTags Jewish wedding, Rabbi, Shabbat, Wedding7 Comments on Why Can’t Jews Get Married on Shabbat? I’m preparing for a big adventure. This week I am traveling to Chicago to attend the annual convention of the Central Conference of American Rabbis. That’s the organization of Reform Rabbis in North America. I’ll see old friends, we’ll study and pray and tell tall tales, and it will be grand. The night of April 1, I’m going to shave my head. This is the first time I’ve traveled so far in a long time, and I am a bit nervous about it. You see, my world has gotten rather small in the last few years due to troubles with chronic pain and arthritis. Nowadays, if I want to go farther than a couple of blocks, or if I am going to need to stand in line, I use a scooter. This will be the first time I’ve traveled with it. So there is a lot on my mind: the airports, the airplane, transport from O’Hare to the hotel, the reactions of colleagues when they see me on wheels — it goes on an on. I’m still self-conscious about using this thing. But if I don’t use it, I can’t go. And I am tired of letting my life get smaller; I have work to do! I had coffee today with a friend who is an old hand at wheelchair travel. He was very encouraging – I might say he even gave me a gentle little kick in the tuchus. It’s easy to hide at home, but there is too much life to be lived, too much Torah for me to live, to give in to that impulse. I’m glad we had coffee, and I’m going to keep him in my heart as I buzz down the hallways of OAK and ORD and down the sidewalks in Chicago. So wish me luck! Life is about to get really interesting. 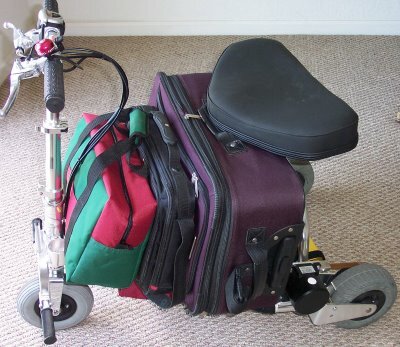 Posted on March 26, 2014 June 14, 2015 Categories DisabilityTags arthritis, CCAR, disability, Rabbi, scooter4 Comments on It’s a Disability Adventure!